PDF of the timeline poster. Born on Mer (Murray) Island in the Torres Strait. Left Mer Island and moved to mainland Australia. Engaged in active community service in the spheres of politics, trade unions, Indigenous Australian rights and services, and public events. Employed as a gardener at JCU and formed friendships with academic staff. Was an active JCU Library user researching non-Indigenous views of his land, people and culture. Discovered he did not have legal title over his land on Mer Island in a discussion with JCU historians Noel Loos and Henry Reynolds. Spoke at a conference about land rights in the Torres Strait at JCU. Decision made to take the Murray Islanders' case to court. Land rights case launched. Eddie Mabo is the first plaintiff in a group action. The High Court ruled in Mabo v Qld (No.1) that the Queensland Coast Islands Declaratory Act 1985 (Qld) was incompatible with the Racial Discrimination Act 1975 (Cth). 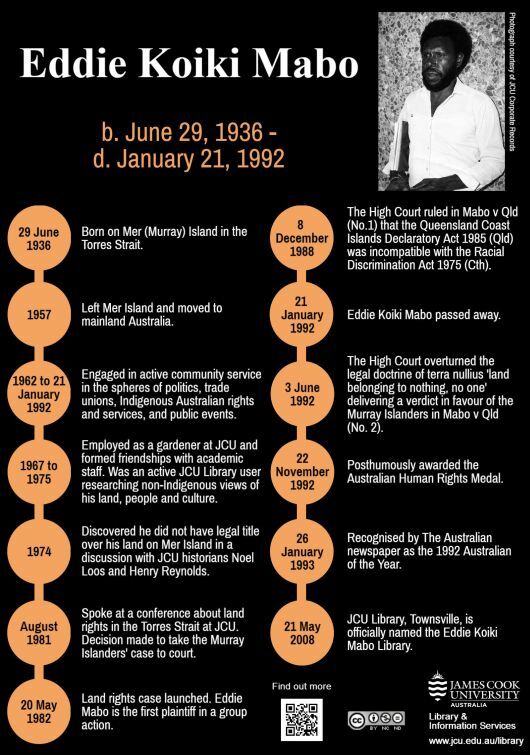 Eddie Koiki Mabo passed away. The High Court overturned the legal doctrine of terra nullius 'land belonging to nothing, no one' delivering a verdict in favour of the Murray Islanders in Mabo v Qld (No. 2). Posthumously awarded the Australian Human Rights Medal. Recognised by The Australian newspaper as the 1992 Australian of the Year. JCU Library, Townsville, is officially named the Eddie Koiki Mabo Library.